This Dip is the first Chili Sauce that I was taught to make when growing up in Bangkok. We eat this with many different vegetables, both fresh and cooked and also deep fried mimosa in egg. The nice thing to eat with this is also fried mackerel or (Pla Tu) that I will add later in the fry category. This is the simpler version of Nam Prik Gapi. However you can also make it without Shrimp. Beat the garlic and the shrimp paste together until well mixed. Add the chili and continue beating. Add the palm sugar and beat until the sugar is dissolved. Add the pea eggplants and beat just to break the shell of the pea eggplant, not make them into paste too! 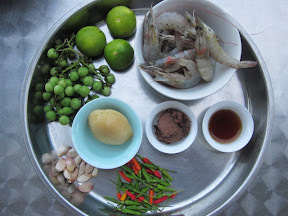 Season with lime juice, Fish sauce. When you get the prefer taste, which is the mixture of sour, salty and a bit sweet then you can add the cooked shrimp and top with pieces of small Chili. Serve with the plate of vegetables. 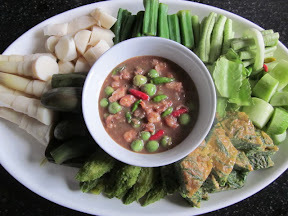 The picture shows the mixed vegetables plate of fresh Winged Bean, long beans, cucumber, deep fried mimosa in egg, cooked small bitter gourd, boiled small violet eggplant, boiled sweet bamboo(from my own garden!) and boiled Okra. What you need to have this with is hot steam Rice.